Just seven minutes away from Key West, Florida is a beautiful oasis that is home to cottages laced with bougainvillea, an idyllic spa and an exclusive beach. Sunset Key Cottages is a Luxury Collection Resort secluded in a 27 acre island situated just 90 nautical miles off the Cuban coast and 150 miles off of Miami. Due to the fact that it leads to the tropics, it has earned the title of ‘The Gateway to the Caribbean Islands.’ Filled with panoramic views of the waters and jasmine gardens, Sunset Key Cottages offers tranquility and charm to those who settle in any one of its lush private homes or cottages. To set foot in Key West means to immediately expose oneself to its culture and history which permeates throughout the island. Guests and travelers will find countless exhibitions, sculpture gardens and local industries that form part of the Cuban history. The island is inspired by many Bahamian influences from the 1800s and 1900s which are now carried on by village churches, art studios and galleries, as well as many other historic spots and landmarks in the area. All these and more are well within reach from Sunset Key Cottages, making the resort the perfect starting destination for all those who want to explore Key West, Florida. From a custom therapeutic massage to restorative facials, the spa at Sunset Key is the place to find pampering and relaxation. All treatment suites come complete with a full bathroom with shower and amenities in a relaxing environment surrounded by beautiful vegetation and orchids. 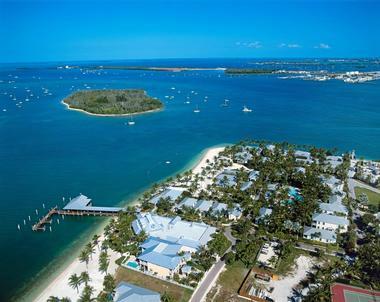 Sunset Key Cottages have a set of accommodations that are distinct from other hotels and resorts. They categorize their rooms mainly into cottages, but provide residences as well. Of course, these pastel colored accommodations do not only have a charming design and ambiance, they also offer luxurious amenities and facilities as well. The One Bedroom Cottage and Two Bedroom Cottage differ only in the number of bedrooms. Both have kitchen, dining and living areas and have flat screen televisions among other entertainment facilities. They’re also pre-stocked with goodies in the fridge and offer spacious verandas with tables and chairs. The Three Bedroom Cottages, on the other hand, have all of the above mentioned plus more space with its two story duplex. Its upgraded version, the Three Bedroom Deluxe Oceanfront Cottage, will have bigger and more sophisticated kitchens, living and dining areas. The spacious living area alone has a table for eight, some lounge chairs and even an event space. It gets even better with the Four Bedroom Cottage. On top of the upgraded kitchen, dining and living rooms, there’s a huge outdoor living area, a patio and a private plunge pool. For even more convenience, there’s also a washer and dryer in the cottage. But for those who are looking for world-class luxuries, the resort offers residences for anyone planning on calling this island paradise their home. Residents will enjoy access to four white sand beaches, gourmet restaurants and breathtaking sunsets. There will be a dedicated homeowner’s service manager to help them meet their needs such as housekeeping services, grocery delivery and the maintenance of underground utilities like water, electricity and sewage. There’s also a rental program that lets homeowners rent out their units to cover expenses when they’re not around. Getting around is easy too. The properties are laden with paved roads conducive for biking and golf carting. There’s enough parking space at the Westin Key West Resort and Marina, which also provides 24-hour regular ferry services. Those who have boats can dock at the Westin Marina. Meanwhile, there are many things to do for residents of Sunset Key Cottages. There’s a spa, a tennis court and some grocery stores that deliver. There are also Gift shops that have all kinds of home accessories, basic necessities and clothing. And finally, there’s a beachfront restaurant that offers great cuisine. 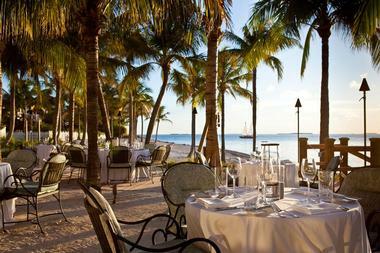 Some of the best restaurants in Key West are actually located right in Sunset Key. This means that guests will have the best dining options available within walking distance, which offer not only the best local cuisine but the most coveted views of the sunset as well. Latitudes Restaurant offers fresh island cuisine like no other, serving guests with luxury indoor or outdoor seating as their option. 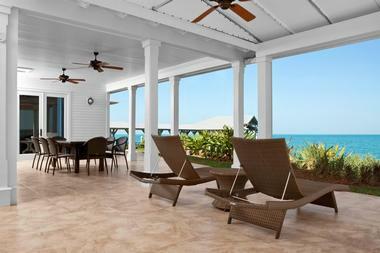 They get to have their breakfast, lunch or dinner with panoramic views of the Gulf of Mexico. The menu offers a children’s menu as well as a small-plate bar menu. There’s also a champagne and wine list for those who want something from the bar. They can also have their choice of lighter beverages near the beach and pool areas. It is suggested that guests go here dressed in casual, country club attire. Bistro 245 is just 500 yards from the resort at the Marina. This is a place for casual dining in indoor or outdoor locations with great views of the harbor. Guests can sample the bar’s pasta, Angus beef and shrimp dishes among other favorites. The bar also serves Sunday brunch and additional breakfast favorites, and a wide selection of desserts. Even locals love Bistro 245 for its outstanding service and great food. Sunset Pier is just behind Westin Key West Resort’s main building and is a great place for casual dining and unforgettable views of the harbor. People often come here for their sunset ritual, having their favorite cocktail or entrees while watching the glorious sunset for the perfect dining experience. Another place to watch the sunset is the Sunset Deck which is just above Bistro 245. This is the place for catching a light casual meal with a cocktail while having a bird’s eye view of the beautiful sunset. Finally, the Flippers Pool Bar is situated near the Sunset Key Pool, and offers drinks service and light fare in an open setting. This is also the place for healthier options like salads and some grilled burgers and lobster rolls. Those looking for more private venues can get in-cottage dining. Guests can order from Latitudes during its operating hours. There’s also semi-private dining at the restaurant’s Hemingway Room. Sunset Key has been the destination of choice for corporate retreats, conferences and other out-of-office company activities. With over 40 guest cottages, Sunset Key can effectively house a group of 150 colleagues and business associates with a wide selection of resort packages to choose from. There’s over 6,000 square feet of flexible meeting space complete with all the audio and visual equipment needed to make every meeting a success. 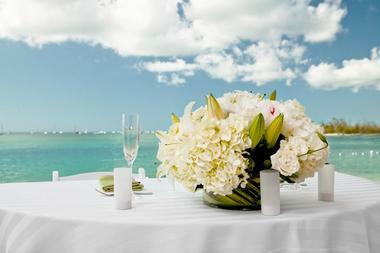 Additionally, Sunset Key has also been recognized as the perfect place for an island wedding. Surrounded by Florida’s blue waters and occupying seven acres of the island, the resort offers enough space for large beach weddings but enough privacy for those who want a more intimate ceremony. Private beach ceremonies are often held at the sandy beaches where the water can be seen and blooming flowers and greenery are the backdrops. Another venue would be the poolside where a lovely red brick path can be the bride’s aisle. These venues can accommodate between 15 to 32 guests. Sunset Key Cottages offers venues for other kinds of gatherings and celebrations as well. May it be a small family reunion or a grand celebration, the resort has a staff ready to help guests plan their event so that they get the right venue, food and entertainment. 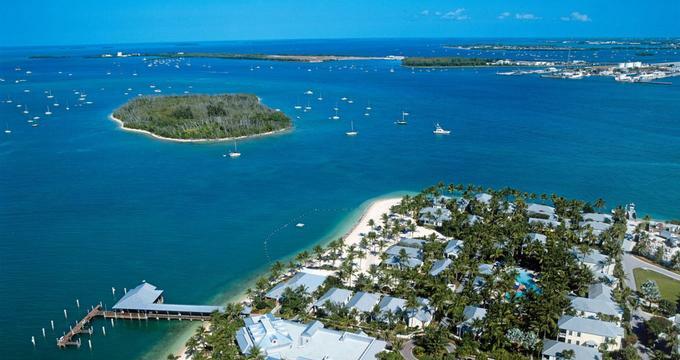 Guests will be greeted by an Island Ambassador at The Westin Key West Resort and Marina who will lead them to a golf cart that will take them to a ferry that will travel seven minutes to reach Sunset Key Cottages. Guests coming from the Key West International Airport can turn right on South Roosevelt Blvd and then right onto Bertha Street. Head straight to Palm Avenue until it turns into Eaton Street, turn right at Whitehead Street and then left on Greene Street. After turning left on Front Street, Westin will be on the right. Those traveling from Miami International Airport will want to take the LeJeune Road to 839 West until it turns into US1 South. Stay on the road all the way to Key West, then turn right on North Roosevelt Blvd. Turn right upon reaching Palm Avenue, heading straight until it becomes Eaton Street. Then turn right on Whitehead Street and left on Greene Street. Finally, turn left on Front Street and Westin will be on the right. More ideas: 25 Best Things to Do in Key West, Florida.